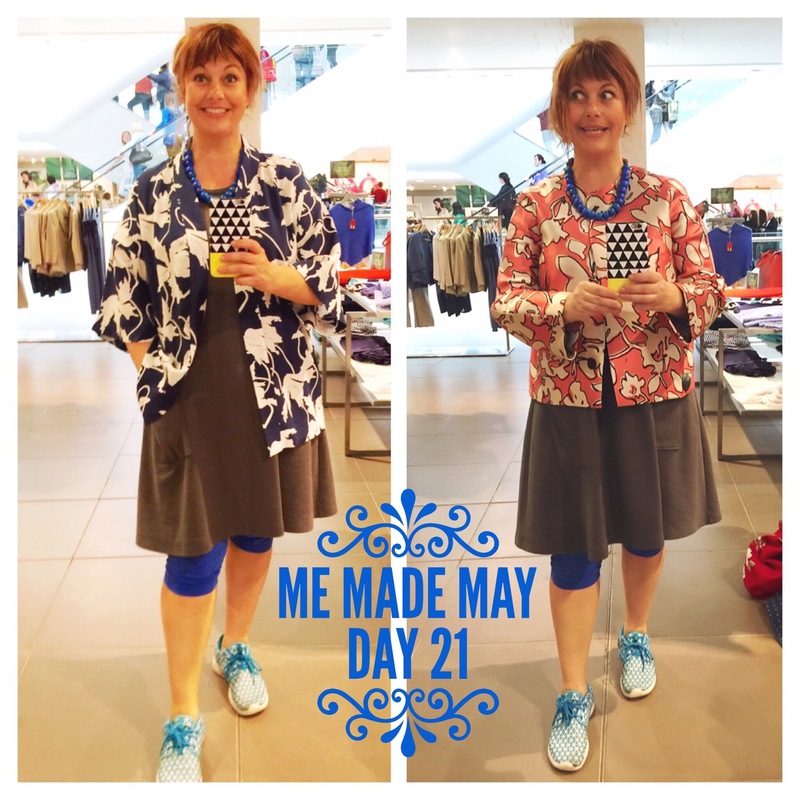 This is my Third week of participating in Me Made May, and I’m having a hoot! 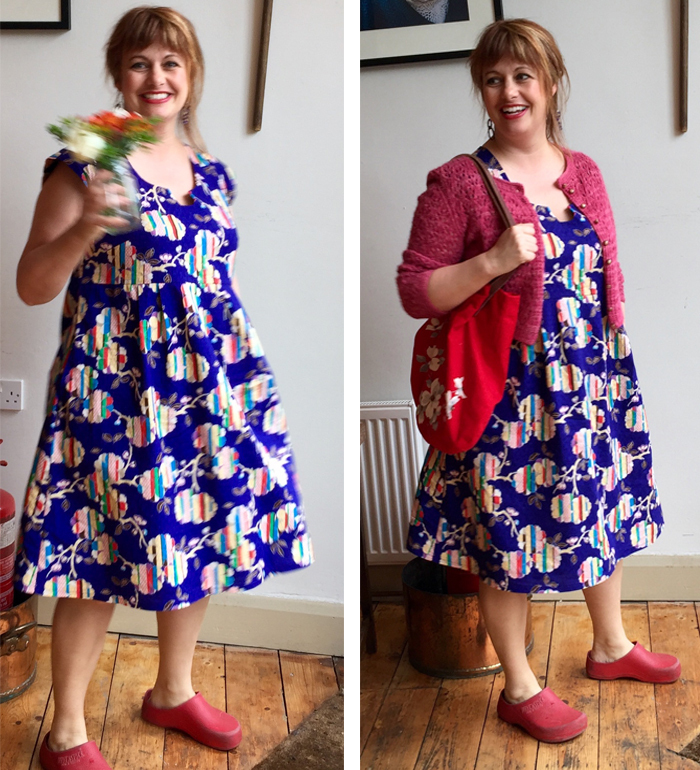 Me Made: Tina Given’s Michelle dress in Nano Iro cotton. Comments: This was my first Michelle dress. I had already altered it in the shoulders and neckline but it was still way too big. The neckline kept falling off my little shoulders. I turned the neckline binding into an elastic casing to gather it up a bit. I wear it, but it ain’t perfect. The Nano Iro fabric is perfect though. Comments: New haircut day so I forgot to get the whole outfit in (my son was taking my picture to send to my husband). I got this jacket out again. I remembered I had this circle skirt that needed a short top to go with it. They pair very nicely. I made the circle skirt from crunchy cotton that I encourage to wrinkle. I added a raw-edged bias strip to the hem as well as a hem tuck and welt pockets. I really like it styled like this. I hadn’t worn the necklace either. It’s Alabama Chanin style. I want to make another strand in blue now. This was a great me made day! Store bought: Sad rubber Birkenstocks, but there was weather! 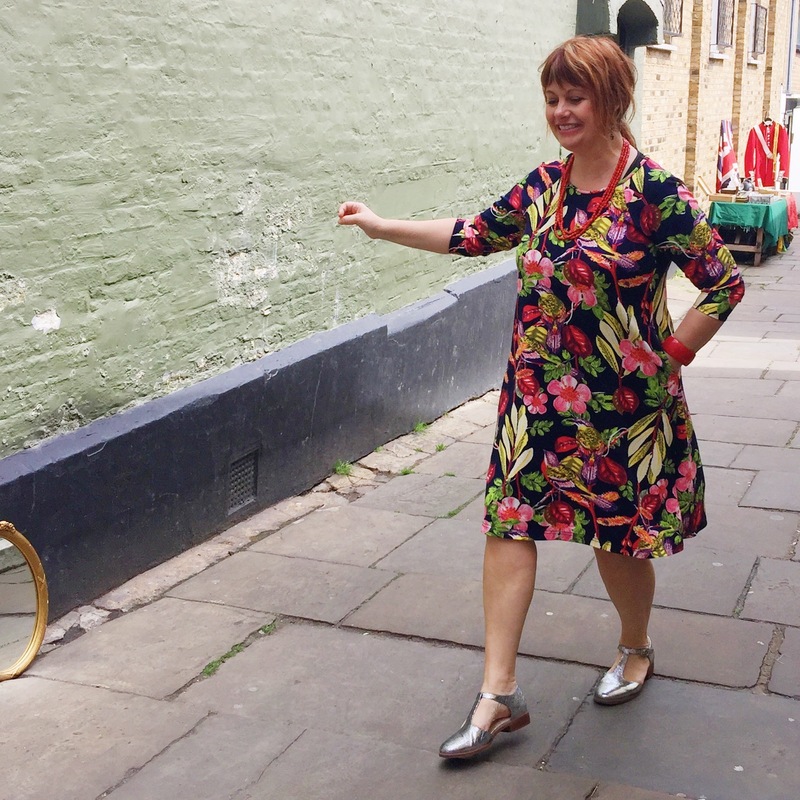 Comments: First outing for my new Washi Dress and I love it. Also, I haven’t worn this cardi as much as I thought I would, because it’s quite small, but it suits this dress. Sorry for the sad shoes. These are my dream shoes, but they don’t live in my wardrobe. Get in my wardrobe, pretty shoes!!!! Me Made: Denim Pilvi Coat, earrings. Me Mended: Jeans, patched and darted. 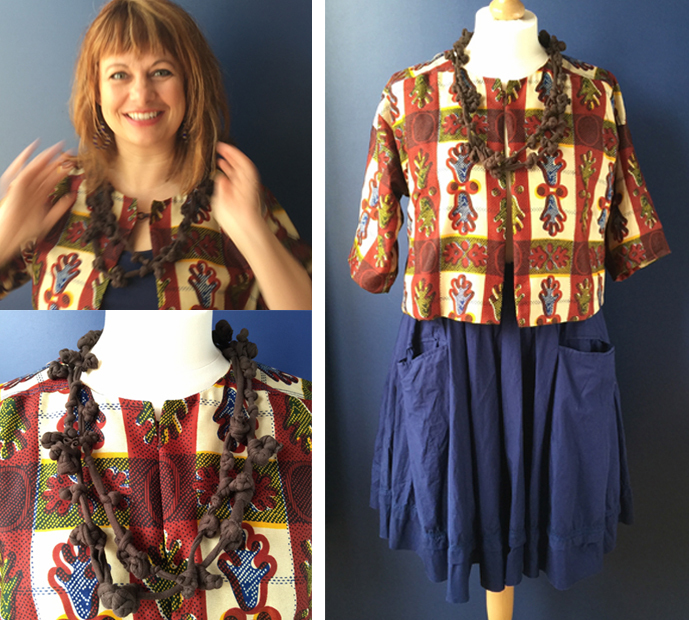 Me Altered: Silk blouse; sleeves removed and remade from attached neck scarf. Store bought: Shoes, secret undergarments. Comments: I made a new Pilvi coat, using the alterations I made to the pattern of my first coat. I love my jolly spring floral velvet one, but sometimes I need something more sombre. This fits the bill. I also removed over 6″ of fabric from the back waist of these jeans. They are a better fit now, but I still want to take out some extra fabric in the thighs. I had retired them because of their atrocious fit, but now they are back in rotation. Me Made: Scuba print raglan sleeve dress. I also wore my new denim Pilvi coat, Elsa bag and pom pom cowl, earlier in the day. Comments: I’m dancing around Camden Passage here. It was the right weather for a scuba dress. I still love this print! Me Made: sweatshirt raglan dress, necklace and (not in picture) denim Pilvi coat and Elsa bag. Store Not-Bought: I’m at John Lewis trying on jackets in this picture. I have discovered that this is my big wardrobe hole. I wanted to try some new shapes and styles before deciding what to make. On the left is a silk kimono with dropped sleeves rather than kimono sleeves. This was much more flattering than I expected. I always worried that this style would make me look bigger. this is a UK size 16. It doesn’t close around my bust but is good for my little shoulders. The jacket on the right is heavy weight silk twill-like Max Mara, size UK 14. Didn’t quite do up over my bust either, but was the right size for my shoulders and back. I really like the idea of adding a bold print this way. 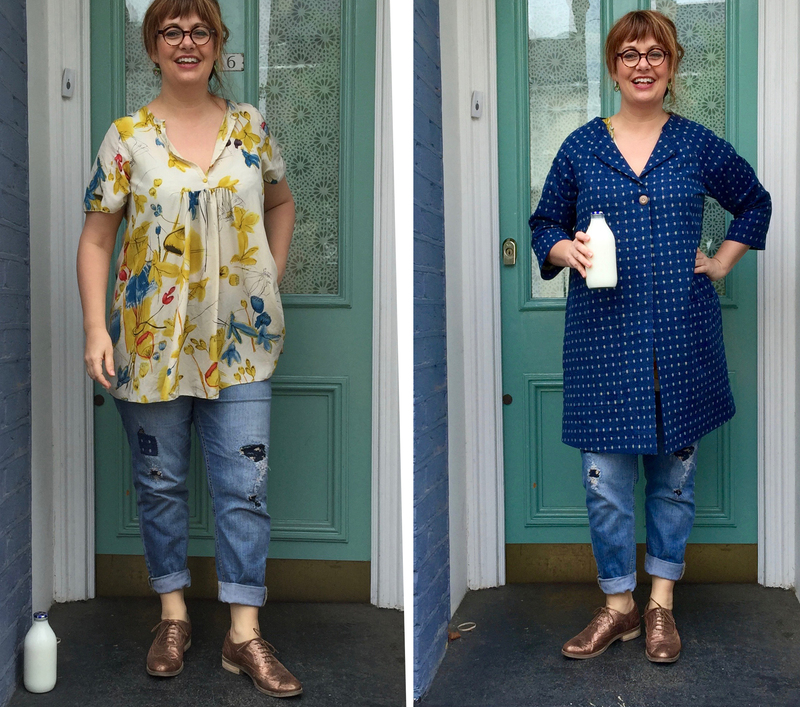 Comments: This was a very busy day which included the Selvedge Fair, shopping for a new fridge and running into Charlotte from the new British Sewing Bee on the tube. I was wearing my new Pilvi jacket with this dress and felt fab. Sneakers because I knew I’d be doing a lot of tiring city walking. 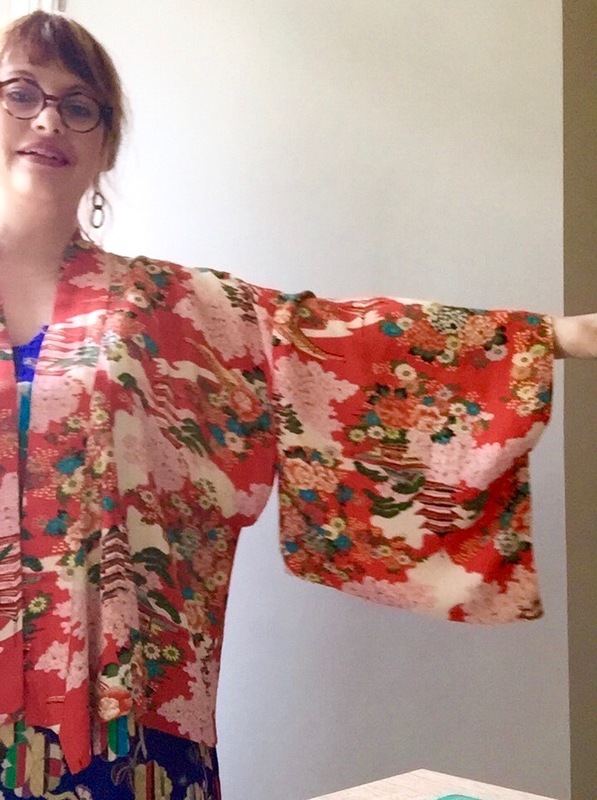 Comments: After trying on jackets and kimono tops yesterday, I decided to alter a vintage kimono in my collection. It was very long so I chopped it shorter to start. I removed some of the width (maybe I didn’t need to) and most of the sleeve width, because it just isn’t practical this way. Took me about an hour. I think it’s cute but I’m looking forward to drafting a pattern for more kimonos! Bring into rotation unworn clothes. Yup: I hadn’t worn the African print jacket in a year and it paired perfectly with my blue skirt. Now I’m thinking what else I could wear it with. Someone on Instagram suggested an Indigo slip dress: good idea. Document everyday of the month with a photo. Yup. Some days are more hurried than others, but this is painless now. Participate in the online community. Yup, I‘m loving my interactions with folks on Instagram and having some good chats. Make 4 new garments for myself. Done! 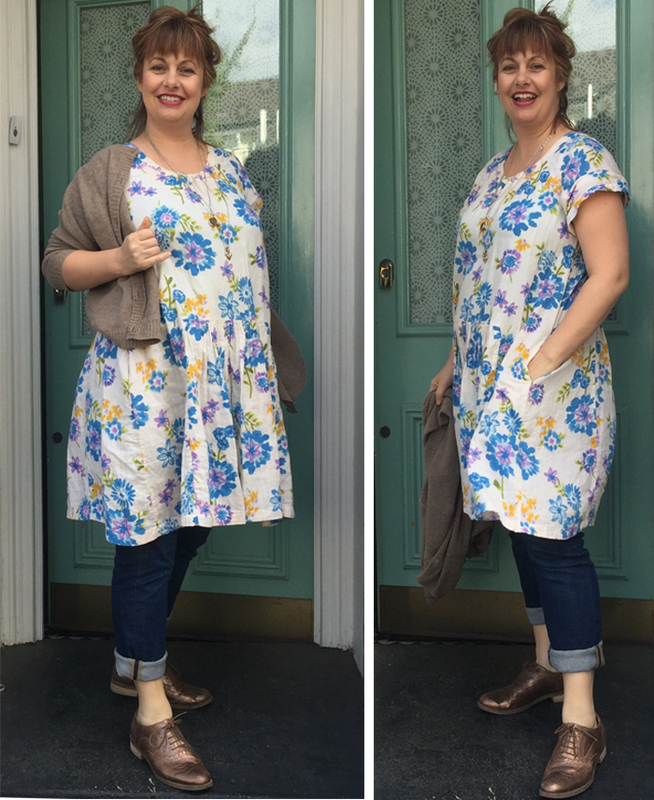 I finished two more garments for myself this week; another Pilvi coat and a Washi dress. 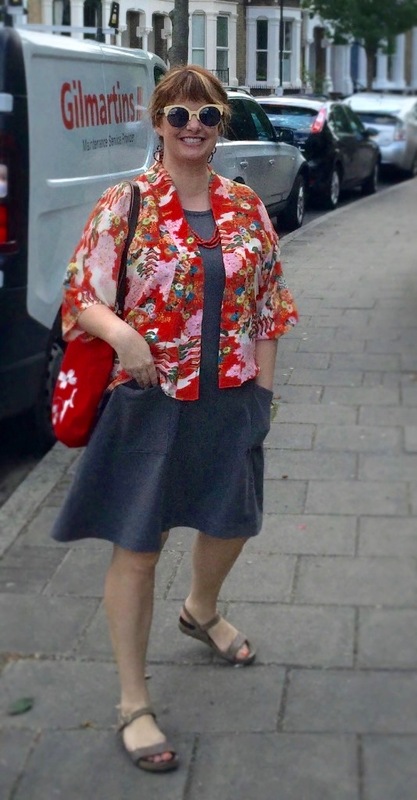 I also did some repairs and alterations this week, including remaking the kimono into a cropped jacket. I have some more makes on the go, but I will try to finish all my sewing WIPs before the end of the month. Where are the holes are in my wardrobe. I had a big Ah Ha moment this week! Sleeveless dresses are a good idea for me. I need to find some good TNT sewn cardigans and light jackets to wear them with. I tried some on at John Lewis and now plan to add some short silk kimonos and cropped boxy jackets to my wardrobe. I’ve also been thinking about what would make a good pair of trousers for me, other than jeans. Need to do some shopping to try stuff on for that. The new haircut is awesome!! Lots of inspiration in this post! Like the Alabama Chanin necklace, cropped kimono (getting my scissors out), cropped jackets (love! )scuba raglan dress. Thanks! I’m blushing Janet. I’m also getting a lot of use out of my cropped kimono. Love the kimono & still totally obsessed by your african jacket. The washi dress is great too. I have one of those in my wardrobe in a black linen & it’s so comfortable – fantastic for layering with a long sleeve T under for cooler weather. I must make another. Have you found any African Fabric yet? I did find a website in Aust that’s stocks some but it seemed expensive & I chickened out! Will do more research…. Love the colors & patterns! You look fab!